You are here: Home / Orphans / World Orphan Day – And YOU’RE the Hero! World Orphan Day – And YOU’RE the Hero! Today is World Orphan Day. A day created to remind us about orphans in our world, and how we should care for and protect them. At Kinship United, we don’t need to be reminded of this day. It’s marked on our calendars, and more importantly, it’s marked on our hearts. And we know, based off your support over the years, that the same is true for you. You’ve helped us care for orphans for more than 15 years. You’ve cared for children who lost their parents to war, natural disaster, political conflict, malnutrition, and terrible diseases. Your help has changed lives of children who otherwise wouldn’t have a home, a family, or a chance at making it through life. You’ve helped children like Lucy, a 12-year-old girl from the Turkana tribe in the Kenyan desert. She came to the Lodwar Kinship Project in 2012 when the Kinship Home had just opened. When Lucy was only 5 years old her father died. He was bitten by a snake while out caring for his sheep. A friend who was with him tried to save his life, but it was too late. Since that day, Lucy’s life took a turn for the worse. Immediately after her father’s burial, everything that Lucy and her mother owned was taken away from them including a flock of 75 sheep, which was their wealth. Her mother had no way to fight back against this injustice because her only child, Lucy, was a girl who couldn’t own property. So Lucy and her mother were left completely impoverished. They went to live with Lucy’s grandmother who welcomed them with open arms. What happened next was like a nightmare Lucy couldn’t wake up from. Her grandmother and then her mother were found dead within weeks of each other. Lucy was left in the hands of her aunts and uncles, who viewed her as cursed. They believed she was the cause of all the trouble she had been through. So her aunts started to mistreat Lucy, making her cook for them but not allowing her to eat the food she had prepared. One day Lucy only tasted the meat she was cooking, and as punishment her aunts locked her up in a room with no ventilation, food, or water for two whole days. Lucy almost died, and only God saved her that day. By a miracle, she heard footsteps passing the room and she screamed at the top of her lungs. It was a neighbor walking by, and this Good Samaritan took her home when she heard how Lucy was being treated by her own family. You probably think this is the where her story gets a happy ending. But unfortunately, Lucy’s troubles were not over. Things were going well for Lucy living with her Good Samaritan, but one fateful morning when she was babysitting, a man came into the house and raped Lucy and the young child. They were badly beaten and left for dead. 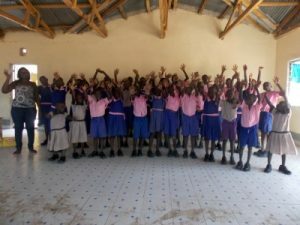 When news spread about the Lodwar Kinship Project opening, it seemed like it would finally be a safe place for Lucy to have a family and find healing from her past, in the care of a pastor. When Pastor George heard her story, he gladly welcomed her in. Lucy has been at the Lodwar Kinship Project for 4 years now, and she has never been better. Her past is so traumatic that she still doesn’t like talking about it, but she is slowly healing. And more importantly, Lucy loves her Kinship family so much. You made this happen. You gave Lucy a home and a family. And that’s what World Orphan Day is all about. Thanks for helping Lucy, and for caring and praying for thousands of other children like her.